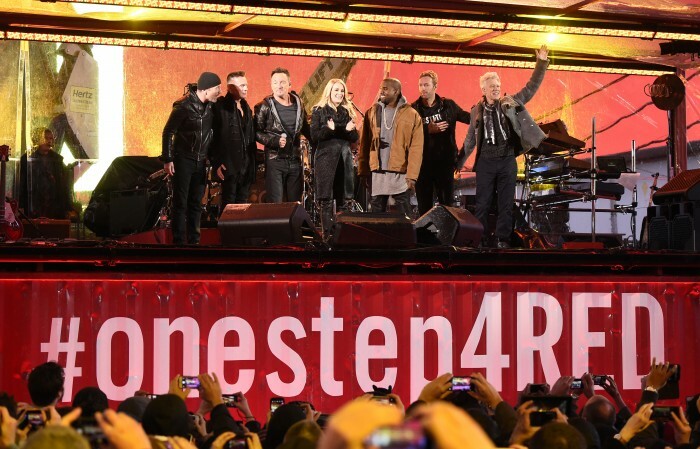 Friends have stepped in to save U2’s surprise World AIDS Day (RED) performance which was jeopardised by Bono’s November 16 bike accident in Central Park. Kanye West and Carrie Underwood will perform at the event - tonight at 7.30pm live from Times Square, New York City - and Chris Martin and Bruce Springsteen will join U2 Minus 1, as the singer remains under doctors' orders to refrain from performing until fully recuperated from his injuries. Adam Clayton, The Edge and Larry Mullen Jr. will be joined by Bruce Springsteen and Coldplay’s Chris Martin, each of whom will take a turn as frontman on the U2 songs. Appearing at the personal invitation of U2, Springsteen and Martin have graciously donated their time and talents to save the World AIDS Day event from cancellation. "This year is a World AIDS Day like no other," said Bono, speaking from Dublin. "The world reached a tipping point in the fight against AIDS - more people were newly added to life-saving treatment than were newly infected with the virus. A lot of people are calling it the beginning of the end of AIDS. "We wouldn’t be at this point without American leadership, people from the left and the right. Today, 13 million people have access to life-saving treatment, up from 300,000 just over ten years ago. Americans don’t know the role they’ve played in this fight. Tonight’s event is to inform them and thank them." The event starts at 7.30pm EST at Duffy Square in Times Square, on Broadway between 46th & 47th Streets. Attendees should enter at 50th Street and Broadway.